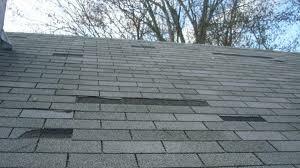 For buildings over 10 years old, missing roof shingles are a sign that an inspection is in order. A typical asphalt roof has a lifespan of 20 to 25 years, and is more likely to be subject to replacement if it was installed over another layer. After a particularly strong storm or hurricane, a property manager should also check the roof. If there are missing shingles, the building might be in danger of inundation the next time it rains. Water logging in the ceiling can result in wood rot, mold, and damaged drywall, all of which will cost more to repair than having individual shingles or the entire roof replaced. While you’re checking the attic, try looking for foreign objects between the roof and the ceiling. If there are any animals that are larger than any ventilation holes, chances are they had passed through an opening in the roof. If you are fortunate enough to find any unwelcome guests inside your ceiling, it is still a good time to seek a professional roof contractor to prevent wild animals from entering. WE DO A FAIR AND HONEST INSPECTION!!!!!!!! ROOFING, GUTTERS ,PAINT & DRYWALL !!! MOST REPAIRS DONE SAME DAY!!!!! LET US HELP YOU SAVE ON YOUR DEDUCTIBLE!!!!!!! !